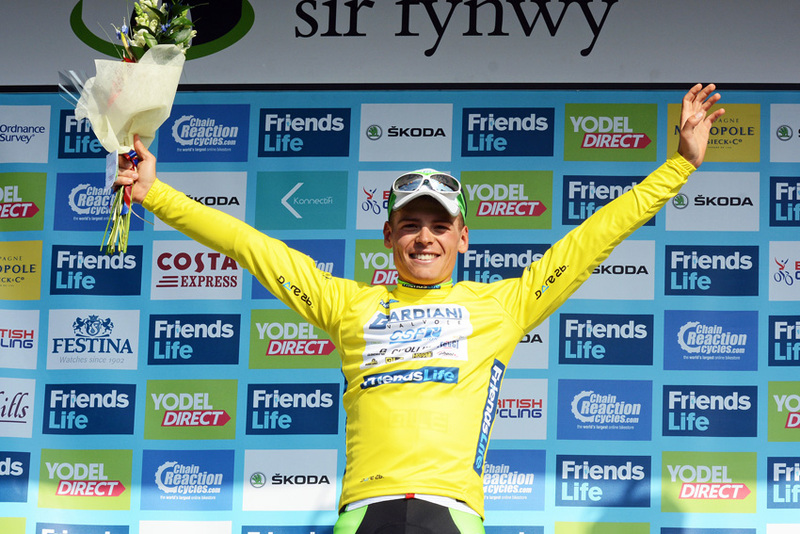 Italian Edoardo Zardini (Bardiani) surprised the overall favourites at the Tour of Britain by winning the key stage to The Tumble and snatching the race lead on Tuesday. Zardini launched a late attack within the final three kilometres of the final climb to take the victory ahead of Michal Kwiatkowski (Omega Pharma-QuickStep), who had moved around Nicolas Roche (Tinkoff-Saxo) in the finale. Defending champion Bradley Wiggins (Sky) headed up the chase of Zardini and placed fifth, 14 seconds back. Thanks to bonus seconds awarded for his win, Zardini sits atop the overall classification 13 seconds ahead of Kwiatkowski, and 17 seconds ahead of Roche in third. Wiggins is fifth overall at 24 seconds. Overnight leader and stage two winner Mark Renshaw (Omega Pharma-QuickStep) finished just under seven minutes down on Zardini to relinquish the yellow jersey and hand team leadership duties over to Kwiatkowski. Earlier in the day, Mark Cavendish could be seen working hard for the team at the front of the peloton to pull in the day’s escape group. Ben Swift (Sky) hangs on to his lead in the points classification by one point ahead of Kwiatkowski. Mark McNally (An Post Sean Kelly) also retains his position in the King of the Mountains jersey, and Sonny Colbrelli (Bardiani) stays in the sprints competition lead. It’s back into England for stage four on Wednesday, with a 184.6km undulating ride from Worcester to Bristol that takes in the Cotswolds.